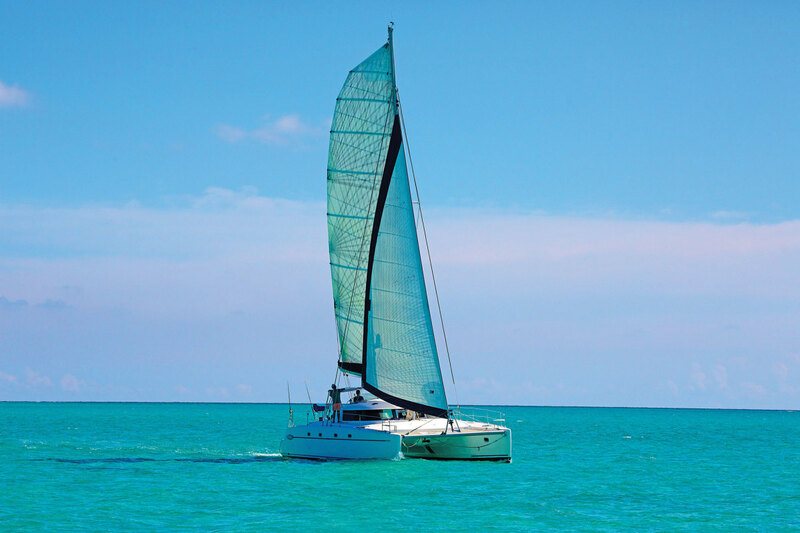 My good friend Tim Ainley asked me to take our 43ft catamaran, Destiny II, on a two-week expedition through the Bahamas from Grand Turk Island to Ragged Island. His plan was to retrace the first landfall made by Christopher Columbus on Grand Turk, according to Josiah Marvel, a historian of the Turks and Caicos islands. Marvel, who started his research in the mid-1980s, is convinced that Grand Turk is where Columbus first touched ground in the “New World” in the fall of 1492. The purpose of this expedition was to retrace Marvel’s purported route on a sailing vessel to confirm distances, courses and descriptions of the various islands as recorded by the famed admiral in The Diario of Christopher Columbus. With the help of my wife, Trish, we stocked the boat in Key Largo, Florida, for the expedition in late October, after which we left for Nassau where we cleared customs and continued on to Cat Island, where Trish would be staying. Friends Tom Reese and Barry Cochran stayed aboard as crew, and we had a beautiful overnight passage from Cat Island to Mayaguana Island, averaging over 8 knots. The following morning, we continued on to Providenciales, using up what was left of the northeast breeze. 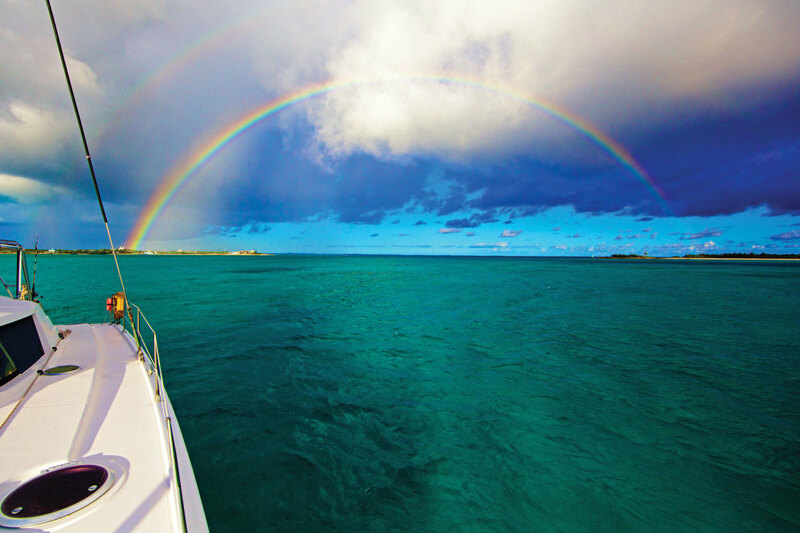 A double rainbow greets the crew at the entrance to Clarence Town harbor. There I met the rest of the crew. I instantly liked both Josiah Marvel and Jon Nickson, the expedition photographer. Both were obviously very enthusiastic about the adventure. Josiah, a joy to talk to, was both very animated and very much the scholar. Jon would be filming the expedition and intended to make a documentary about the adventure. Tim Ainley, a well-seasoned captain with intimate knowledge of the Turks and Caicos and the Bahamas, had been running Beluga Charters in the Providenciales area for 30 years. My wife and I have spent the last 40 years exploring all corners of the Bahamas on various boats. The team was set. After a few days of preparations and re-provisioning we were ready to begin. The night of November 1 we all slept onboard Destiny II to be ready for a first-light departure to Grand Turk Island. [advertisement]Early the next morning the wind outside was light, but as the day went on it veered to the north and then north-northeast, building to around 20 knots. Our close reach turned to a beam reach and later, as we turned along the arc of the Caicos Islands, became a broad reach in the building breeze. At one point we were escorted by dozens of playful dolphins. Because the forecast called for increasing northerly winds, we chose to spend the night at Hawks Nest anchorage to the south of Grand Turk Island. The entrance to Hawks Nest is wide and deep, and we soon were in protected waters. 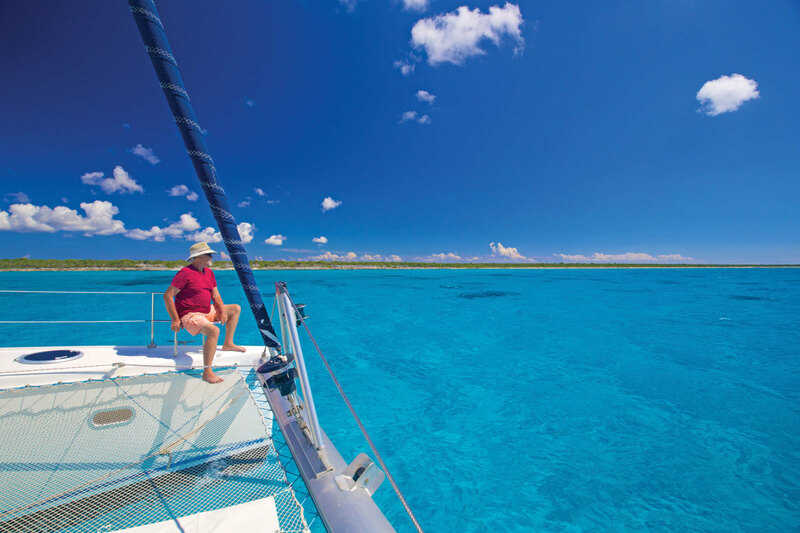 With Grand Turk to the north, Salt Cay to the south and many patch reefs in between, we were well sheltered. Josiah Marvel, Tim Ainley and the author on the shore of Grand Turk Island at the Hawks Nest anchorage. 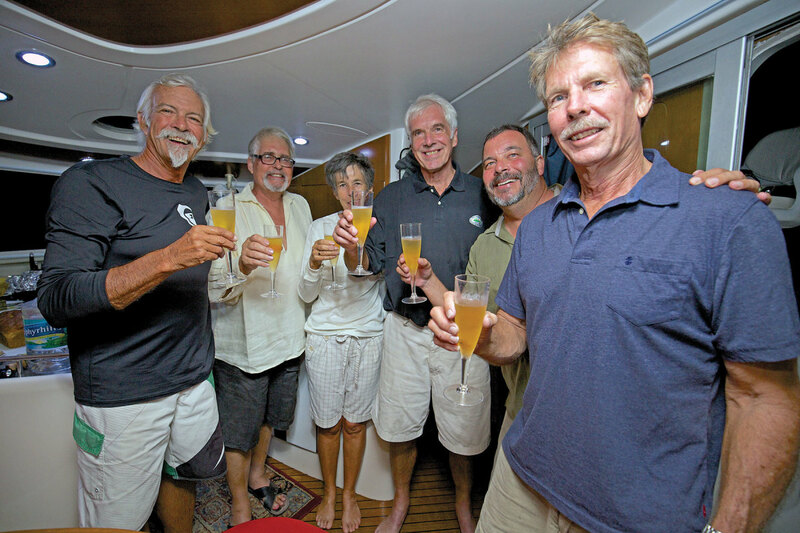 As we explored the island’s shore, Tim sent an e-mail to the governor of the Turks and Caicos Islands, Peter Beckingham, and his wife, Jill, inviting them for cocktails aboard Destiny II. Gov. Beckingham graciously accepted Tim’s invitation. I was a bit nervous at the thought of picking up the governor and his wife at 1900 in the dark, with 25-knot winds and a slight shore break in an 11ft inflatable. Thankfully, Tim volunteered to come along. The meeting was a great success, the mood was light as the champagne and rosé did its work, and we enjoyed two hours of good company and conversation. Next morning we had anchor up at first light. Outside, the wind was strong, blowing 20 to 25 knots with higher gusts. At first, the going was rough as we close-reached into large 12ft swells. From the helm, I turned to see Josiah grinning in the cockpit—he was loving the ride. Once we rounded Philips Reef, northeast of East Caicos, we eased sheets for a reach across the top of the Caicos Islands. One gybe offshore brought us to the anchorage off Pine Cay behind Fort George Cut. Once inside the reef, we decided to continue on and anchor in Stubbs Creek. The calm anchorage was quite a contrast to the day’s wild sailing and the next morning we once again we set off at first light and soon sailing out of Leeward Cut, where we set a course for the southeast tip of Mayaguana Island. The seas and winds were down and I thought of shaking out the reef in the main, but decided to wait to see how the breeze filled in. By mid-morning we were blasting along at 9 to 12knots in a 20-knot northeasterly. Mayaguana came into view around 1100. We coasted along the southern shoreline before arriving at the reef entrance of Abraham’s Bay just after 1500. Clearing customs was painless, and afterward, Josiah noted that Columbus most likely headed to Mayaguana on October 16, as he had noted in his diary that he saw a lone Lucayan native in a canoe outside of the reef on his way to Mayaguana and changed course to pick up the islander and offer him hospitality. Columbus wrote that he sailed all day in light wind and arrived near the southeast point of the island, which he named Fernandina, in honor of the king of Spain. [advertisement]The fifth day of our expedition was a layday and we decided to explore some of this remote Bahamian island. I called an old friend, Scully Cartwright, to arrange an island tour by car. Scully showed us the other two settlements on Mayaguana, Betsy Bay and Pirates Wells. Back onboard Destiny II, a small skiff came alongside with three local fishermen. “We have lobster for sale,” they called. My first thought was was to decline, as I expected we’d soon have all the fresh seafood we wanted. But I relented and asked how much. “Ten to 20 dollars” was the reply. I asked to see a 10-dollar specimen, and the man in the bow held up about a 4lb lobster! “OK, I’ll take two,” I said. I invited the couple on the only other sailboat in the anchorage, who were old friends, for dinner. We feasted on delicious surf and turf. The next morning we set sail for Hogsty Reef in a 10-knot headwind. But after an hour of poor progress we realized we would not make it there before sunset, so we altered course and once again entered Abraham’s Bay. Columbus described seeing brightly colored fish near a reef at the entrance to a large shallow harbor, which Josiah believed to be Abraham’s Bay. Josiah also noted that Columbus described the coast of Fernandina (which he called Mayaguana) as all beach with no rocks. Even though the south coast of Mayaguana facing the Windward Passage still bears scars inflicted by Hurricane Irene in 2011, it is predominately beach. At the southeast end of Mayaguana we identified undisturbed places to look for a Lucayan settlement. Columbus anchored twice at Mayaguana and took on water from the island’s many shallow freshwater wells. The forecast for the seventh day of our trip was for light southerly winds, and Tim and I rose at 0200. The revised plan was to sail to Great Inagua Island, rather than Hogsty Reef. We slowly followed the GPS trail back through the reef to exit Abraham’s Bay in the dark. We had followed this track three times in the last two days and now felt comfortable doing it at night. 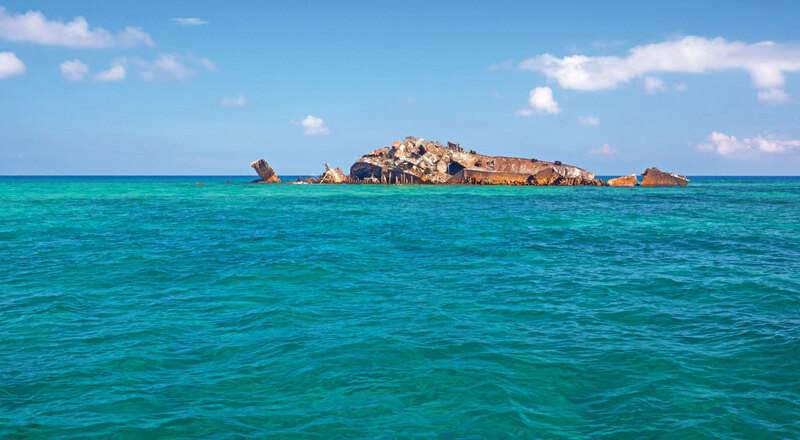 We sighted Little Inagua island early in the afternoon and the turquoise waters close in along the northern shore were so inviting we decided to take time for snorkeling on the scattered coral heads. We had planned to anchor off the north side of Great Inagua, inside the large Ocean Bight, which Josiah had concluded was another of Columbus’s anchorages, but found the holding poor. After several failed attempts to get our anchor to set, I decided the best anchorage would be Alfred’s Sound on the northwest coast—30 miles away. With only an hour of daylight left it meant entering at night, something I normally avoid in the Bahamas, especially in harbors I have not visited before. But in this case, I saw little other choice. As the moon was to rise around 1930, we reduced our speed to arrive around 2100. This would give us some light as we picked our way in between the reefs on each side. Fortunately, the breeze was light, and we could see the bottom in the moonlight. Tim and Jon were on each bow shining flashlights on the bottom ahead, and Si monitored our course on an iPad. All worked well, and we found a sandy spot in 8ft of water to rest for the night. Sunrise showed us the sound we had worked into the previous night—crystal clear water over white sand ridges with surf breaking on the reef a quarter-mile to the north. To the south, there was a long white beach: what a welcome sight! We took some time that morning to dive the nearby reefs to the north. After lunch, we contacted park warden Henry Nixson to arrange a tour of the salt ponds and to photograph the famous pink flamingos there. This turned out to be a real safari over the rocky roads as Mr. Nixson took us deep into the interior of Great Inagua, over the rough causeways crisscrossing Lake Victoria. We saw dozens of water birds, as well as large flocks of flamingos. On our way back to the boat we stopped to see the Morton salt plant, with pyramids of salt over 60ft high. Evidently, Great Inagua is the second largest salt producer in the world. The ninth day of our expedition once again brought light winds, so we motorsailed from Great Inagua to Hogsty Reef. The first signs of the atoll were two shipwrecks on the reef’s edge. I am well acquainted with most of the remote corners of the Bahamas but had never explored Hogsty Reef. We started the day snorkeling the reefs close to the small cay to the north. Later, we sailed Destiny II around the atoll passing close to the surrounding reefs and wrecked ships. Before sunset, Tim and Jon dove up some conch for dinner. In the Diario of Christopher Columbus, the great navigator mentions sailing northwest to what Josiah concludes is the south side of Acklins Island and smaller Castle Island, our next stop. The wind was once again on the nose as we headed northwest, but at less than 10 knots. We decided to make for an anchorage on the south side of Castle Island called Mudaian Harbor. Inside the reefs, we found a clear sand bottom a few hundred yards from the white sand beach. The water was flat without surge. It was a gorgeous spot, a real find. [advertisement]We were all anxious to get ashore to explore this beautiful island. We beached the dinghy and began walking along the white sand beach toward the island’s southwest point, where there’s a lighthouse. I strolled with Jon, who asked if I ever found bottles with messages in them. I said, “No, not yet.” Amazingly, only minutes later, Jon picked up a clear Stolichnaya vodka bottle, well sealed with a cork and melted wax. Inside was a rolled-up paper and a strip of engraved copper—a message in a bottle. It was from an artist in New York City who has set dozens of these messages adrift. The Castle Island lighthouse is a beautiful, thick-walled structure that was built in 1867 and stands 113ft above sea level. We’d climbed the spiral stairs to the top a few years earlier, but too many of the wooden steps were now missing. At the base of the tower, there were two wooden houses that were once occupied by the lighthouse keepers but have also since fallen into ruin. We were now very low on diesel and could not reach the marina at Clarence Town unless the wind picked up enough to sail. The forecast continued to call for light winds out of the north and northeast. In our chart kit and cruising guide there was mention of a gas station at Landrail Point on Crooked Island, so we departed our beautiful anchorage and began motoring with one engine toward Landrail Point. Ten miles out we got a cell signal and called the gas station to confirm the availability of diesel. When we didn’t get an answer, I called Gibson’s Lunch Room, and the friendly voice of Willie Gibson informed me the gas station was shut, but that diesel was available in the settlement, so we made dinner reservations and agreed to work out the fuel situation the next morning. The north winds dropped to nothing as we approached Landrail Point minutes before sunset. The next morning we woke once again to light winds. If we were to continue, we needed at least two jerry cans of diesel. After a few phone calls, we learned there was a diesel tank truck with plenty of fuel, but the pump had failed and there was no backup pump. We were taken to the truck and given a cut-down plastic milk jug on a string. By lowering this scoop into the truck’s tank we could bring up a half gallon of diesel at a time. After some effort, we soon had our two 5-gallon jugs full of fuel. The trip to Clarence Town was remarkably smooth, and Destiny purred along leaving a long wake on the glassy sea. What a contrast to the normally brisk trade winds and heavy seas in this Crooked Island Passage. As we entered Clarence Town harbor that afternoon, we were welcomed by a double rainbow over the scenic harbor town. This harbor has been one of my favorites since I first visited 23 years ago. Situated on the windward side of Long Island with breaking coral reefs on each side, it can be intimidating when entering. Once inside, there are numerous anchorages with good holding. We dropped our hook well before sunset just off the southeast side of Strachan Cay, across from the town. The dawn brought rain as well as a fresh northeast breeze. Back out in blue water, Destiny II was loving the fresh breeze. The 45-mile run to Cape Santa Maria on Long Island passed quickly. What a treat to be sailing on a brisk beam reach after days of light winds! 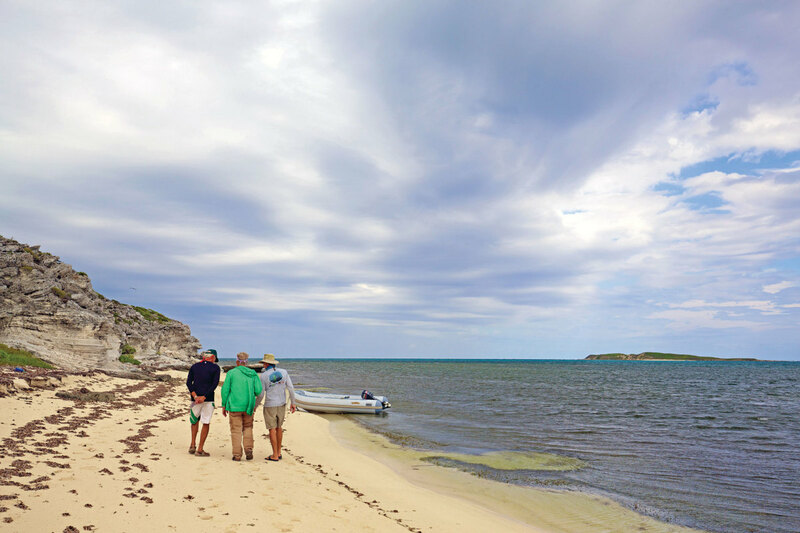 Cape Santa Maria is distinguished by tall white cliffs, with a monument to Columbus on the tallest part of the cliff and a narrow creek to the east leading into salt flats. Even with the late start we easily made it Calabash Bay right on time for a 1700 happy hour at the Cape Santa Maria Resort. Calabash Bay is stunning, with clear water, a sandy bottom and two-mile long beach. From my viewpoint, the expedition was a success in several ways. Josiah was delighted to follow in his theoretical wake of Columbus and felt more confident that his Grand Turk first-landfall theory was correct. I learned volumes about Columbus and the waters and islands he visited upon arriving in the Caribbean. It was a true pleasure spending time with Tim, Josiah and Jon. Our evening conversations over a couple bottles of French wine will forever be fond memories. I can only imagine how Christopher Columbus must have felt on first seeing these spectacular gin-clear waters and tropical beaches. I have cruised the Bahamas for over 40 years and they still astonish me. Our early November trip following Columbus took us through the same waters around roughly the same time of year, navigating among what were then the Lucayan islands. It was, in my opinion, a success. Despite the varying winds and weather conditions, we examined eight of the nine anchorages Columbus is presumed to have stayed at according to the Grand Turk landfall theory. 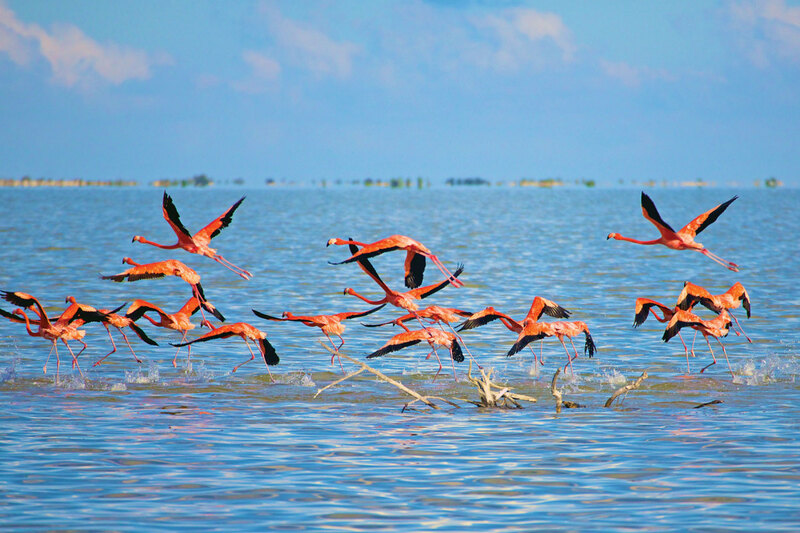 Off to the west of Northwest Point, Great Inagua. The anchorage we were not able to confirm was one in the shallows south of Ragged Island. Adverse winds and the need to refuel prevented us from visiting this anchorage, but scholarly agreement that Columbus was here is already practically unanimous. Dave Calvert is the owner of Calvert Sails, a multihull sailmaker. He cruises with his wife, Trish, aboard their Fountaine Pajot Belize 43, Destiny II, throughout the Bahamas, both recreationally and on charter.